WB for a 4 point major on Saturday. First time since we have been in dogs, Terry missed attending Westminster to celebrate his birthday in Style with friends and family at the Monterrey Bay Fish Grotto Restaurant in Pittsburgh. WB/BOS for a 3 point major on Sun. Sun: WB/BOW/BOS for a 3 point major finishing her Championship. 2006 has proven to be one of a kind for us. Sun: WB/BOS for a 3 point major. Terry attended the annual Westminster Dog Show in NYC. they had a good time slushing thru the 27" of snow NYC received that weekend. We started showing our very own George @ 10 month old. Within the first three weekend, he earned most of his singles including BOB over Specials and at the New Castle shows he earned his 2 majors. At the New Castle shows Farleys D Standard made history once again. 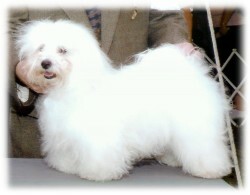 Ch Farleys D Poison Ivy became a champion shown from the BBE class exclusively. She is the first Apricot in the US to finish from the Bred-by class. It was an exciting day for us!! We were fortunate to have a Standard Poodle litter born over Memorial day weekend. Continuing with his streak of wins, George finished his Championship at the South Hills shows @ a week over 11 months. It was an exciting weekend at the Canfield Cluster Shows. aka Ch Farleys D Ken Mar Little Anne. Visit her under Papillon Pages. 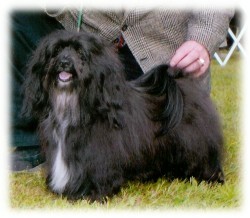 We started showing three Havanese between July and August and the first to finish of the three was Ola. She was a Specials girl who loved to run upfront and showed she was a natural for the ring. She also finished at the Canfield Cluster. Terry was asked to Judge the 1st Three Rivers Papillon Club of PA Sweeps in Canfield this year. and was pulled in the group as well. At the end of August, at the Chagrin Falls Shows, we had a great weekend. We showed 4 dogs both Sat and Sun and we won with all of them. (1) Magic went BOB both days. (2) Hailey our Papillon earn 2 singles. Sun: WD/BOW/BOS over Specials for a 4 point major. (4) Sugar earned WB both days for a 4 and 3 point majors. Terry showed all the dogs and he was flying high that weekend. 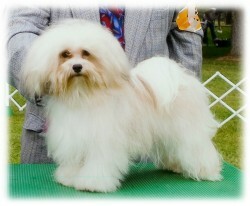 We started the month at the Altoona shows and were able to finish 2 Havanese the first day of the weekend. Toby finished by going WD/BOW/BOB over Special for a 3 point major. went WB/BOS for a 3 point major finishing her championship as well. Pat and Sue of Glen Iris were there to share in the excitement. We were fortunate to have a Havanese litter born this month. We started Antonio's show career at the Cumberland Shows. He earned the following at a little over 6 months old. What a weekend we had at the Bloomsburg Shows this year. 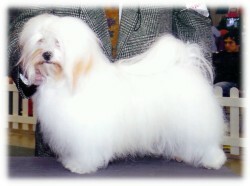 our #6 Havanese Champion for this year. First, our silver standard poodle Quincy earned his second major and became a champion on Saturday. You can see more about him under Poodle Pages. We were fortunate to have a Papillon born the same weekend. all handled by Terry and John!!! and have given us their friendship. Without the quality and genes of these dogs we could not done so well.